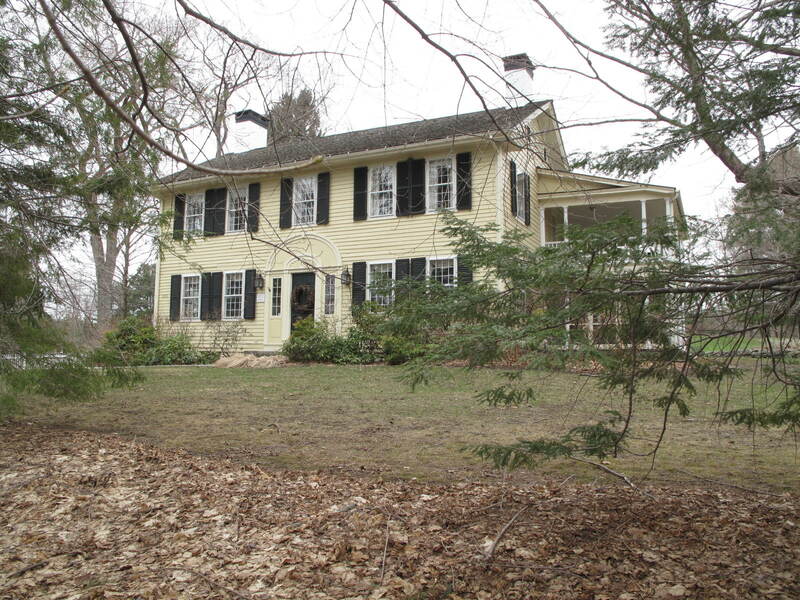 This wood-framed Federal period house exhibits the classic characteristics of the type: gable roof, two stories, five bays, central entrance and large brick end wall chimneys. The chimneys have been painted white with black bands at their flared tops. The current door surround may or may not be a restoration of the original. It has a very large arched pediment with key block; within it is a smaller pediment with sunburst design over the door section; fluted pilasters flank the ¾-length, 8-pane sidelights. The door appears to have been replaced. Lantern light fixtures on either side of the door surround. A 2-story cross-gabled rear ell, has a rear extension with slightly lower gable roof and off its rear is a 1-story lean-to. On the left side of this ell is a side entrance porch with a polygonal extension at the back, Doric columns and millwork railing. On the right side of the rear ell is a 1-story cross-gable extension, which has a brick end-wall chimney. Windows are primarily 12-o-12 double hung sashes with authentic window blinds. The foundation is stone. A later 2-story porch/balcony addition to the left side of the house is slightly recessed from the front facade and wraps around to the rear of the house. It has a hipped roof supported by Doric columns and engaged columns on the second floor; the first floor is a screened porch. The house has been resided with metal clapboard. A large c.1882 basement barn is located behind the house and embanked into a small hill on its right side, which provides direct at grade access to the threshing floor. The left side has the exposed stone basement that originally served as the animal quarters. There are two other farm outbuildings on the property, each wood framed with gable roofs, and located to the rear and left of the barn. A wood picket fence runs along the driveway and the outbuildings, which leads from East Street past the left side of the house back to the barn. An in-ground swimming pool is located to the left of a stand of mature coniferous trees to the left of the fence. NOTE: The earlier Form B states that the rear ell was the original farmhouse. Unless a physical examination by a qualified architectural historian has confirmed this, it is far more likely that the rear ell is the original kitchen wing for this high style house. Thomas Rockwell of Ridgefield, Ct. first settled in the Bartlett Farm, circa 1770. He is believed to have built a log house a few rods sought of the present dwelling. In 1795 Rockwell deeded the farm to Jeremiah Osborn, also of Ridgefield, CT. Osborn sold the property February 16 1797 to Zadock Hubbard. Hubbard built the frame house that is the rear ell of the present house. Allen Metcalf purchased the property in 1808. 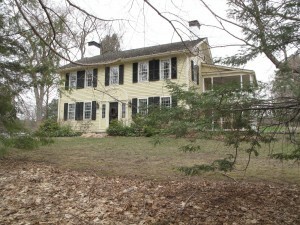 Originally from Sharon, Ct., Metcalf had settled on the farm later owned by George O. Peck in about 1794. Metcalf was a joiner and a house builder who constructed the front 2.5 story part of the house in 1810. Edmand Dewey laid the cellar for him. Mr. Metcalf also ran the Lenox Coffee House. Later his son, Allen C. Metcalf, purchased the Sabin Farm of 50 acres south of his father. Allen C. Metcalf died in 1846 and his father and mother moved to Ohio. John Kellogg purchased the property and stayed for 2 years. The farm was then purchased by William Bartlett in 1849. B.F. Bartlett inherited the farm upon his father’s death on July 6, 1857. A fire on June 24, 1881 destroyed the Old Sabin barn, house and shop. The present house narrowly escaped. A barn was built to replace the Sabin barn in 1882. The property was acquired by Stephen Pavlosky from Rufo in 1991 and then acquired by Judith Ann Pavlosky in 2000.